The guided-missile destroyers USS Dewey and USS Sterett will leave San Diego on Tuesday to join the Japan-based amphibious assault ship USS Wasp on a deployment in the Indo-Pacific Region. The pairing of the destroyers with a standard three-ship amphibious ready group is part of the Navy’s new “up-gunned expeditionary strike group” formation. “Surface ships like Dewey and Sterett enhance an amphibious force’s ability to conduct its primary mission of ship-to-shore movement in the littorals, particularly in a contested environment,” the Navy said. In addition to the accompanying destroyers, the Wasp has been modified to carry Marine F-35B stealth fighters, America’s newest combat aircraft. It will be the first operational deployment of the new fighters aboard a Navy ship. 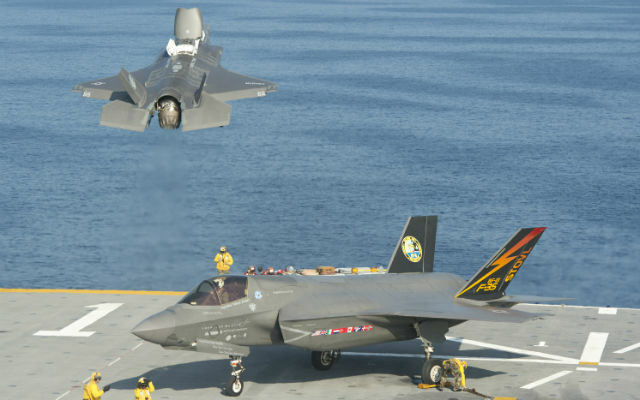 The Marine version of the jet can take off and land vertically, making it ideal for use on amphibious assault ships, which are smaller than the Navy’s supercarriers. The two destroyers from San Diego were deployed together in 2017 on a mission to train with the Japanese other allied navies in the Pacific.